View from Seneca Rocks, Monongahela National Forest, West Virginia. 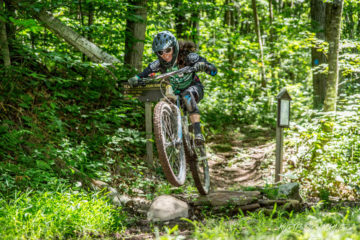 A mountain bike loop that plunges into one of the wildest corners of the Southeast. 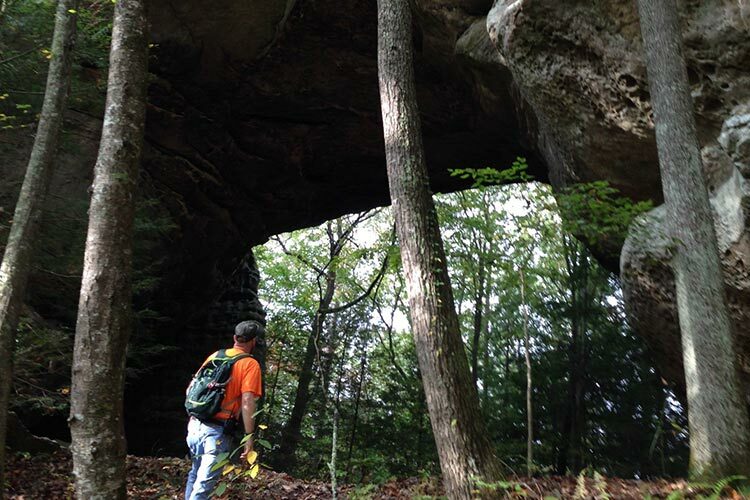 Trails to stunning natural bridges that welcome rather than forbid horseback riders. A backpacking route that takes trekkers across a prime stretch of the Cumberland Plateau without worries that it will be scarred by clearcut logging. These are all features of National Recreation Areas in the Southeast. It’s a varied group. Most are remote but one cuts through the region’s biggest metro area. They include some of the East’s biggest—and clearest—lakes, as well as its most ferocious rapids. Allowed uses range from hiking to riding all-terrain vehicles. Variety, in fact, is one of the few common qualities of National Recreation Areas. Each is created by its own federal law—a law that determines the government agency that supervises its operation and lists the activities that are and are not allowed. This can make forming new Recreation Areas a tough political process; witness the stalled plans to create the Pisgah and Grandfather national recreation areas. The upside: It puts power to determine uses of public land where it should be—with nearby residents, environmental groups and businesses interests, says Sam Evans, a lawyer with the Southern Environmental Law Center. 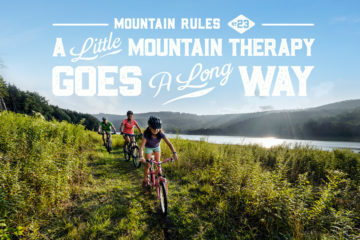 The other common thread of National Recreation Areas is right in the name; they encourage residents to go out and enjoy natural tracts such as these, some of the Southeast’s best destinations for mountain biking, paddling and hiking. 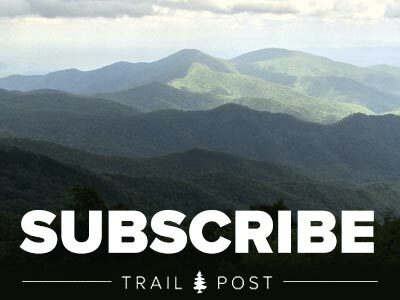 Bring food, water and at least one friend when mountain biking the Huckleberry Trail in the Spruce Knob-Seneca Rocks National Recreation Area, said Travis Olson. “When you go down the Huckleberry, you’re really getting into the deep woods. You need to be self-sufficient,” said Olson, an avid mountain biker and the organizer of the annual Gravel Race Up Spruce Mountain (GRUSK). 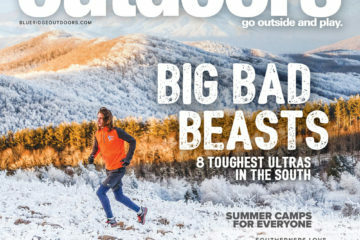 It may be his favorite ride in Spruce Knob-Seneca Rocks—unless it’s the other Epic, the North Fork Mountain Trail, which “follows a really narrow ridge for 24 miles, so you get these incredibly vast views,” he says. 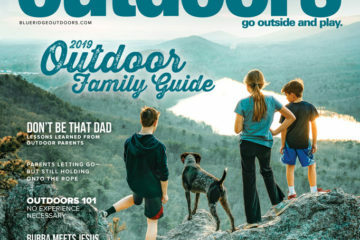 That last description especially fits Seneca Rocks, a 40-minute drive north of Spruce Knob and one of the most famous rock-climbing destinations in the East—a bastion of “trad” climbers who carry their own gear and remove it once they complete the pitch. Not that you need to be super skilled or super fit to enjoy the area. The mountain bike trails that Olson raved about are also open to hikers. One of the area’s most acclaimed trails, the Spruce Knob/Seneca Creek loop, is just the right length, 16.5 miles, for either a monster day hike or more leisurely overnight backpacking trip. Visitors who have the desire to climb but not the skills or equipment, can spend a day at NROCKS, which not only offers caving trips, zip lines and canopy tours, but also one of the nation’s first “via ferrata” courses. Italian for “way of iron,” this feature provides harnessed climbers with stainless steel rungs to ascend dramatic outcroppings on private land south of Seneca Rocks. Attend Treasure Mountain Festival held in September in Franklin, W.Va. The festival has celebrated mountain culture for 50 years and includes quilting displays, musical performances, and beard-growing and turkey-calling contests. At Canaan Valley Resort State Park, a half-hour north of Seneca Rocks. 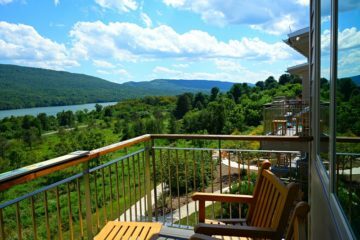 It offers 160 rooms as well as cabins and campsites, golfing and mountain-bike rentals. Many of its 18 miles of trails connect to longer routes in the Monongahela National Forest. Visit the Front Porch Restaurant, Seneca Rocks. Situated above Harper’s Olde General Store, its namesake porch features stunning views of town’s namesake rocks. “I love the pizza at the Front Porch,” Olson said. This recreation area has less to do with seeking adventure than with soaking up scenery and heritage. The most treasured views are not of mountains, but of calm, clear Kentucky and Barkley lakes—two of the largest such bodies of water in the East. “It’s just a peaceful place to be,” says Cindy Sholar, administrative assistant with the nearby Cadiz-Trigg County Tourist & Convention Commission. Covering 170,000 acres, it extends north to within a few miles of the Ohio River and south to beyond the Tennessee state line. It contains 500 miles of trails, many of them open to both mountain bikers and hikers, as well as 200 miles of forest roads. The prime backpacking route is the 56-mile North/South Trail, the northern portion of which passes seven seasonal springs, offers frequent views of Kentucky Lake, and skirts several of the estimated 240 cemeteries in the Recreation Area. The region’s 19th-century history is celebrated at The Homeplace, which is run as a 1850s-era working farm, with staffers and volunteers engaged in such activities as shearing sheep, spinning yarn, raising heritage chickens and pigs, and growing heirloom vegetables. “It’s a great place for folks to see how things used to be done,” said Emily Cleaver, a spokeswoman for the Forest Service. Detour north to visit Paducah, KY, formerly a gritty river town transformed into a regional arts mecca designated as one of UNESCO’s Creative Cities. Attractions include the National Quilt Museum, and its transformative Artist Relocation Program has served as a model for cities across the country. In a houseboat, the ideal way to soak up views of the lakes and access the wooded shoreline of Land Between the Lakes. Rentals are available at several marinas, including the Kenlake Marina at Kenlake State Park. At Cap’n Jim’s Grill, on a peninsula on the eastern shore of Lake Barkley. “One of my favorite things to do is go to Cap’n Jim’s on a Saturday night when the water is just like glass,” Sholar said. The most famous of these formations is Twin Arches, a pair of natural bridges that top out at more than 100 feet high. Combined, this formation is the largest of its kind east of the Mississippi River. Big South Fork, which in 1974 became the first National Recreation Area formed under the supervision of the National Park Service, covers 125,000 acres of the Cumberland Plateau in eastern Kentucky and Tennessee. It is adjacent to the 700,000-acre Daniel Boone National Forest and near several smaller state parks. 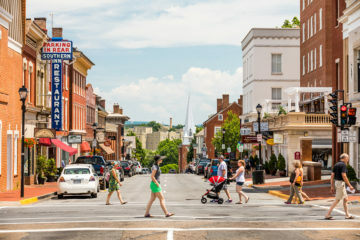 And though its visitors pump about $10 million into the local economy, according to the National Park Service website, it attracts fewer than 700,000 annual visitors. 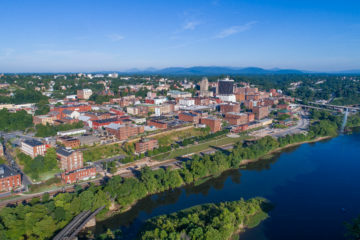 That number has dropped since the early 2000s, and is a tiny fraction of the count at popular destinations such as Great Smoky Mountain National Park, which draws more than 11 million tourists per year. Among the many attractions available to the park’s relatively few visitors, according to the Park Service: 141 miles of hiking trails, 182 miles of horse trails, 24 miles of mountain bike trails, and 244 miles of streams. That includes the north-flowing Big South Fork of the Cumberland which the American Whitewater website calls “one of the hidden crown jewels of the Cumberland Plateau.” The 6.2-mile stretch between confluence of streams that form the river and Leatherwood Ford includes several Class III and Class IV rapids, the site said, though the roughness of these runs varies with water flow, said Keila Egedi, of the Sheltowee Trace Adventure Resort in Corbin, Ky. The company offers guided rafting trips of the upstream section of the river on weekends from mid-April to mid-May, when water level are usually highest. It rents canoes and kayaks on downriver sections, which, though tamer, include rapids rough enough that the company requires them to be portaged by rental clients. No matter the route, she said, the views of the clear, cliff-lined river are spectacular. “The Big South Fork is just plain gorgeous,” she said. Backpackers can choose between two routes suitable for multi-day treks, the 44-mile John Muir Trail, and the 319-mile Sheltowee Trace, which extends north deep into Daniel Boone. Premier day hikes include the 6-mile Twin Arches Trail Loop and the 5.6-mile out-and-back hike to the Angel Falls Overlook, which offers what Park Service literature calls an “awe-inspiring view” of the Big South Fork. Hikers will see not only natural bridges, but another of the Plateau’s trademark formations—rock overhangs. And the park’s dense hardwood forests and clear, rhododendron-lined streams are sparsely populated versions of sights common at more popular destinations. Attend one of the series of events, including storytelling sessions and an annual planting festival, at the park’s Brandy Creek Visitor Center and the Blue Heron Interpretive Center. 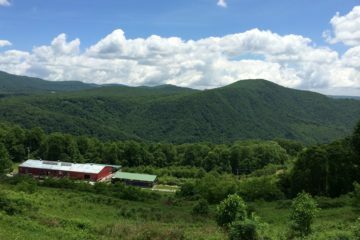 At Charit Creek Lodge (Ccl-bsf.com), which like the Smokies’ famous LeConte Lodge, offers comfortable lodging and dining in a wilderness setting. Charit is accessible only to hikers, mountain bikers, and horse riders. At Simply Fresh, in Jamestown. Selections include steaks, dinner salads and shrimp tacos. “Their food is amazing,” Phillips said. Sally Bethea lives within the city limits of Atlanta and less than two miles from the Georgia State Capitol building. It’s about as urban as the Southeast gets. Which sums up the appeal of Chattahoochee River NRA, a series of 15 park units called “the string of pearls,” scattered along 48 miles of the river from the northern fringe of Atlanta’s metropolitan area to its downtown. Signed into existence by President (and former Georgia Governor) Jimmy Carter in 1978 and managed by the National Park Service, the park is the city cousin in a generally backwoods clan of National Recreation Areas. Because of its proximity to the nearly 6 million residents of greater Atlanta, the park’s visitor totals and economic impact dwarf those of most other Recreation Areas; a recent Park Service study found the Chattahoochee drew more than 2.7 million visitors in 2016, supported 1,841 jobs and created a total economic benefit of $166 million. 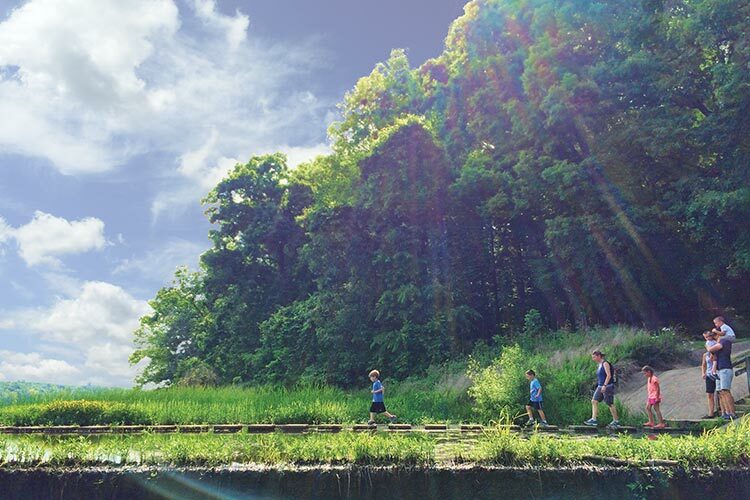 To encourage even more tourism and preservation, this stretch of the Chattahoochee was named the nation’s first National River Trail in 2012. 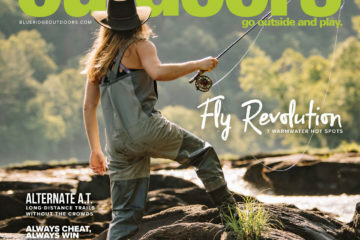 But the Chattahoochee wouldn’t be so popular if it looked like it ran through a big city, said Bethea, who retired from her longtime role as Chattahoochee Riverkeeper in 2014 and now serves as board president of the Chattahoochee Parks Conservancy Inc. (chattahoocheeparks.org). One of the kayak rental landings run by Nantahala Outdoor Center is just off Interstate 285. But once you “get around the first bend you would never know you were near a city. It’s a great escape from the hustle and bustle,” said concession manager George Virgo. 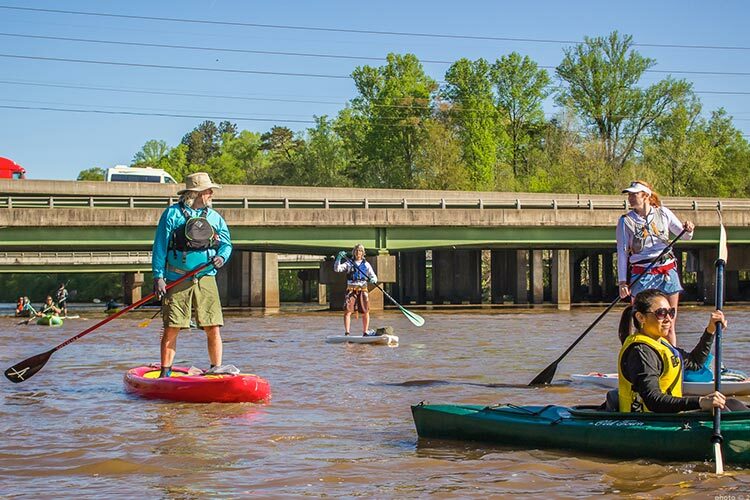 The other outpost is at Johnson’s Ferry North, where southbound paddlers encounter flatter water flowing through upscale residential neighborhoods before reaching Park units that contain some of the Recreation Area’s 80-plus miles of trails. Among the most popular spots is Cochran Shoals, a hub for afterwork trail runs and weekend hiking and mountain biking excursions. It can get crowded, Virgo said, and so can the river. But the shallow water discourages motor boats and paddlers can easily avoid the rowdier floating parties, which tend to form late in the afternoon on Saturdays and Sundays. To the Back to the Chatt River Race and Festival, hosted by the Chattahoochee Riverkeeper. Held annually for 16 years, it features races of different lengths, a beer barge, and a boat decoration contest. Camping is not permitted in the park and riverside lodging is scarce, but airbnb.com lists several options with river access, from single rooms to whole houses. At Heirloom Market BBQ, a few blocks from Cochran Shoals, it’s a mecca of Korean-style barbecue in the Deep South. “It’s phenomenal,” Virgo said. The Recreation Area, which was established in 1988 and is operated by the Park Service, protects the gorges along 25 miles of the Gauley and nearly six miles of the Meadow River. 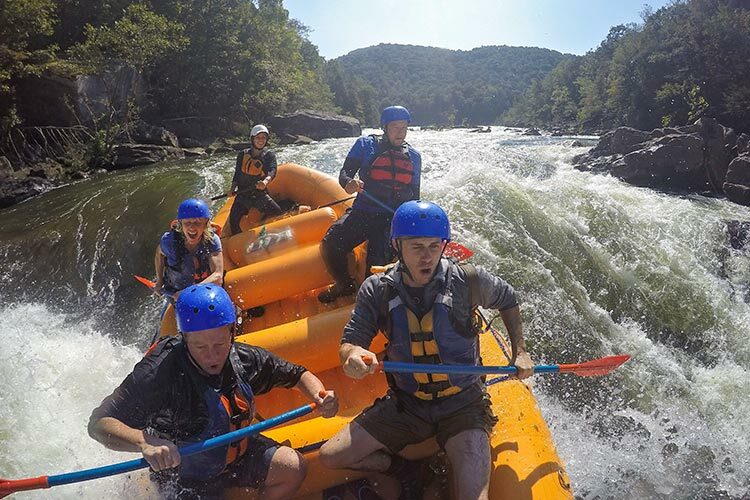 The height of the rafting season, which annually attracts about 60,000 visitors, lasts only a few weekends after Labor Day, when the Summersville Dam begins releasing huge volumes of water. “In the middle section you come to this huge hydraulic. You have to get on one side or the other or it’s not going to be pretty,” Stevenson said. The name of another famous run is also misleading, she says. There is nothing comfortable about Pillow Rock, she said. “There is just a lot of volume of water pushing right into this giant rock,” she said. Pillow is followed by two hydraulics waiting to trap fallen paddlers, the Toilet Bowl and the Room of Doom, and a car-sized boulder called Volkswagen Rock. In lower water, companies lead tours of inflatable kayaks called duckies. And in warm weather, tourists flock to Summersville Lake, above the dam, the largest lake in West Virginia. Its clear, deep water is ideal for scuba diving and all forms of flatwater boating, “including stand-up paddle boarding, which has become immensely popular,” said Marianne Taylor, executive director of the Summersville Convention and Visitors’ Bureau. 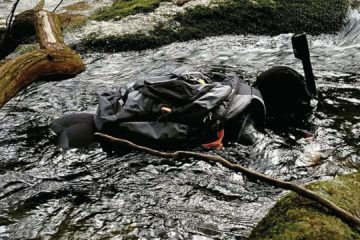 And paddlers should not become so absorbed with running rapids that they ignore the animal and plant life that thrive in a distinctive habitat created by the rapidly flowing water and dramatic elevation changes. Federally protected species in the park include the Allegheny woodrat, cerulean warbler, Eastern hellbender, and finescale saddled darter. Among its rare plants are the Appalachian blue Violet, balsam squaw-weed and Virginia spirea. Attend the Gauley Fest, an annual celebration of the Summersville Dam release featuring a whitewater marketplace and live entertainment. At Summersville Lake Retreat, which offers cabins and campgrounds on the shore of the lake just north of the Recreation Area. At Maloney’s Pub in Summerville, which serves stir-fries and wraps along with standard bar food, and is packed with sports memorabilia and television screens. “It’s just a nice laid-back place to go after a day on the water,” Taylor says. 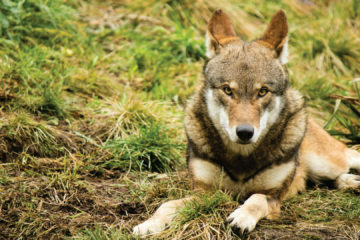 This Is a Death Sentence for Red Wolves.